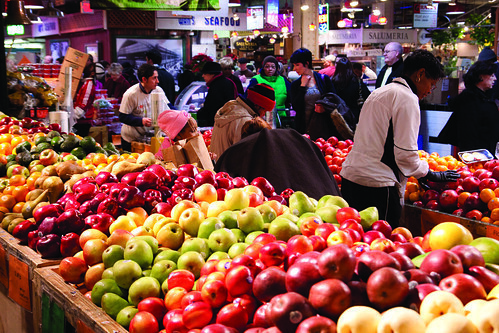 The Reading Terminal Market offers shoppers fresh goods. Grocery stores in metropolitan areas changed when consumers started demanded locally grown foods, instead of digesting freezer- burned pesticides. The solution for stores was to label off-brand products as locally grown and virtually pesticide free. Yet even with these labels, it is hard to know exactly where a particular food is from and what is in it. The Reading Terminal Market offers an alternative. Walking through the historic marketplace, I found myself dizzily navigating my way instinctively through my senses. The aroma of freshly roasted coffee, the simmering of newly caught tuna and various pastries baking may sound overwhelming, but my nose refused to fail me. The prepared food stands are very appealing, but others, offering raw meat and dairy goods are both convenient and great alternatives to the aisles of the common grocery store. After talking with a number of these stand owners, I discovered Lancaster food cooperatives provide most of the fresh produce and meats sold. These organizations work by connecting small-local growers with larger shipping companies to supply individually-owned vendors and small restaurants in the tri-state area. The Pennsylvania Dutch influence is profound, accounting for an entire corner of the block-long structure. Here you can find foods prepared with an ethical code – rooted in moral and cultural laws, not bottom-line profits. WALBERT YOUNG TTN Shoppers peruse the produce selection of Reading Terminal Market. What came to mind as I ate an authentic chicken potpie was a warm and loving attention to their product. Defrosting a frozen pie tin from the grocery store reminds me of how lazy I am. The atmosphere of the market is leisurely. People can sit, eat and listen to live piano music. Even though the Reading Terminal Market is a huge tourist destination, locals often frequent the establishment. Businessmen in suits digest locally grown chicken placed elegantly in sandwiches, while shoppers from the Gallery sit down with shopping bags, disrobing their winter attire for a freshly roasted cup of coffee. For Temple students, the Reading Terminal Market is within spending limits but the trek may be too great a distance to carry multiple grocery bags. An outdoor farmer’s market is located in Northern Liberties, which operates on most Fridays and Saturdays, especially in the more temperate months. Vendors in the Northern Liberties Piazza are also connected with the food cooperatives in the Delaware Valley. For those who prefer to stay close to Main Campus, Lancaster growers continually bring Amish produce, cheeses and preserves to the brick plaza at Cecil B. Moore Avenue and Broad Street on Thursdays when fruits and veggies are in season. Dan Dorr can be reached at dan.dorr@temple.edu. Summer Beckley finds the facts on some of marketplace’s vendors. Columnist Brianna McGrody discusses farmers markets close to Main Campus.